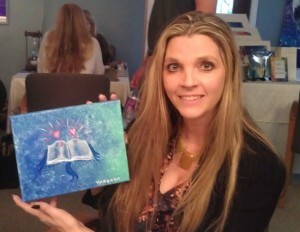 “I’m in LOVE with the Dragonfly painting Pete did for me during my event! Thank-you Pete! 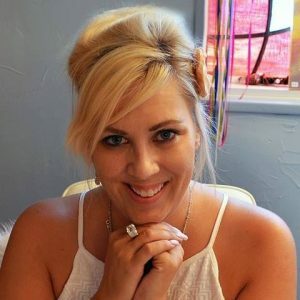 You do amazing work! I cannot wait to share the stories about why a rose is so important. For you to pick up on that is incredible! Love You! “Pete is one of the most creative and talented individuals we have ever had the pleasure of working with. His unique perspective and crystal infused art pieces are beautifully fashioned. We personally own several pieces that are hung in prominent places in our home. 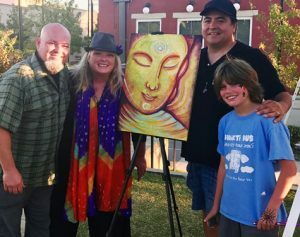 Pete’s spiritual side clearly shines in his artwork through his bright colors and abstract strokes he paints. 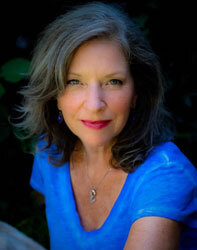 We are honored to have Pete as our premier Cosmic Yogi Movement and Festival artist. His art design for our festival is one of a kind piece emitting a beautiful, happy, glow representing our festival exactly the way we desired it to be expressed. Pete is an INCREDIBLE artist. We collaborated on some energy healing work and he then painted my essence. He has a unique, psychic ability to connect the dots to help people better understand who they are. 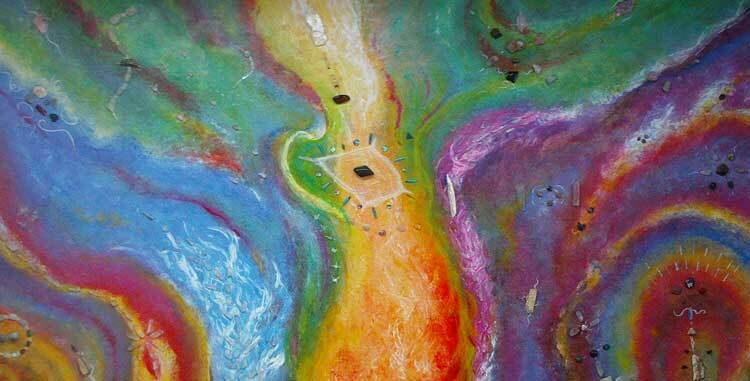 Don’t hesitate to contact Pete to have him to a visionary painting for you. Pete came into my life at exactly the right time…Divine timing of course! His paintings have supported, empowered and “marked” my journey. Each one has been a powerful, integral part of my spiritual growth. The most trans formative art piece has been “The White Lion“. Revelations have been revealed and untruths have been healed as each one has connected to my Truth within. Love you so much Pete! So grateful for you! Pete is a true visionary! 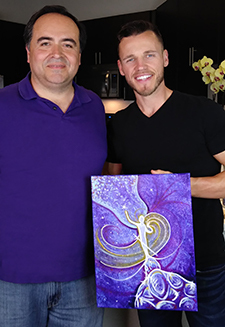 He painted my picture after a few questions with remarkable insight and filled with energy that helped me complete writing my son’s story! 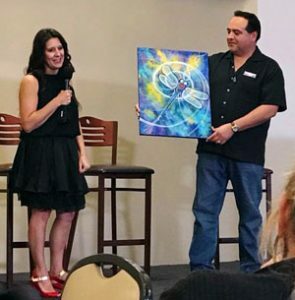 “Pete Taboada’s beautiful crystal infused painting – “Universal Unity” has brought about an elevated energetic experience in my meditation classes at the Lightworker’s Sanctuary which are held in the same room where the painting is located. 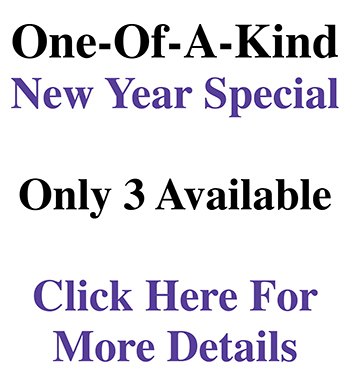 I have conducted these meditation classes elsewhere and it is always wonderful. 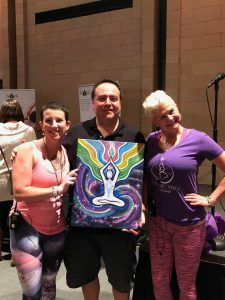 However, in this room specifically in front of this beautiful high energy painting, the energy is very high and the participants are able to connect to the meditative calm space easier and faster. 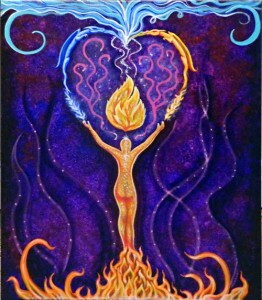 This painting, titled “I Am Holy Fire“, was commissioned by Usui/Holy Fire Reiki Master, DeAnna VandeZande. I Am Holy Fire now hangs in my healing room, generating and emanating healing energy to all who enter.